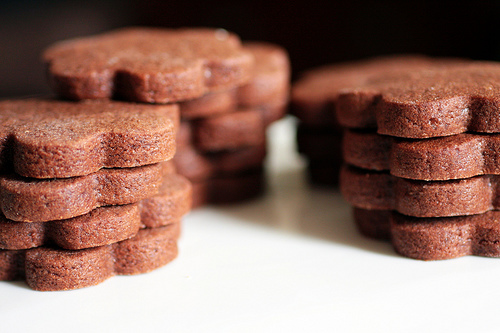 I thought, since it’s exam season, I might deviate from my usual posts of tips and tricks, and share a wonderful recipe I found for cookie-cutter biscuits. I have road-tested these and not only are they easy to make, but they also hold their shape really well when you use cutters. I don’t have a musical note shaped cutter, but you can buy them easily online. This one, from Amazon.co.uk is currently retailing at only 99p with free delivery. If you don’t fancy making them musical note-shaped, you can do them any other shape you like! Preheat oven at 180C (Gas Mark 4, 350F). Line several trays with greaseproof paper or baking parchment – I did three and used them several times over. Sieve and mix dry flour, salt and baking powder in bowl and set aside. Mix butter, sugar, eggs, vanilla and cocoa together. Gradually add dry ingredients, and mix until smooth. Wrap in clingfilm and chill for at least one hour. Roll out cookie dough on a lightly floured surface. Cut into desired shapes, brushing extra deposits of flour off the top. (It does disappear once baked, though, so don’t overly fret if they go into the oven looking white.) You can pack them fairly tight on the baking trays, as they do not spread much. Bake for 8 to 11 minutes (depending on thickness) until the edges are firm, and the centres are slightly soft and puffed. You want to take them out just as they turn from glossy to dry looking on the top – any longer and they will be a bit on try dry and crumbly side, rather than soft. Transfer to a wire rack to cool, and try not to eat them all at once! Have you found any great cookie cutter cookie recipes? Share them below! Or even post a photo of your musical cookies. This entry was posted in General, Teaching and tagged baking, exams, for fun, tips & tricks on 14th November 2013 by .